Real estate -- particularly residential real estate -- is an extremely important factor when discussing recessions in the modern era. To a certain extent, real estate is where economic theory goes to die. One possibility is that the theory was largely developed when the norms in real estate investment were conservative, so attention was moved to the industrial sector. However, the herd tendencies in the housing market may now overwhelm the industrial cycle. 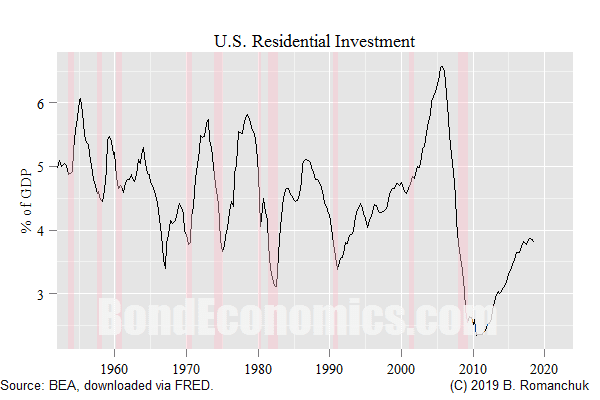 The chart at the top of this article underlines the importance of housing with respect to recessions, which shows the percentage of GDP in the United States that residential investment represents. If we focus on recent decades, the eye is drawn to the relentless climb until 2005, and then the spectacular fall heading into the Financial Crisis. It should be noted that this weakness was underway well before the collapse of the financial markets; to a certain extent, the excesses that were uncovered at the end of the cycle overshadowed the much broader weakness that doomed the economy. Conversely, the lack of movement around the 2000 recession helps explain the mildness of that recession -- for people not connected to the technology industry. As I discuss below, this shows that we need to be careful about mono-causal explanations of recessions; we can have a recession even if the real estate market is not under stress. However, it is a good bet that any recession will have an effect on the real estate market. I will outline some of the main points of interest in point form; turning them into a story that flows will be done later. The order of the points is somewhat arbitrary. Economic theory that focuses on the business sector and/or the timing of consumption decisions are not particularly well suited for describing the effects of residential investment. If the housing market were stable, we perhaps would see a business cycle dominated by things like the inventory cycle. However, residential investment creates an impressive pro-cyclical feedback loop within the economy. The value of the traditional approach is that it allows us to understand how the feedback loops within the economy work, the issue is that we need to realise that housing is a large internal source of instability that has to be included. The housing market is a market. The implication is straightforward: its fortunes are prey to the animal spirits of market participants, like any other market. Uncertainty about market tendencies overwhelm analysis based on rationality. Although most of Hyman Minsky's writings date from the era when housing finances was relatively stable, there are good reasons why he is possibly one of the best known economists (putting aside Keynes and various pro-free market economists) in the financial markets. The leverage cycle he describes is the key source of instability in housing. The problem is that real estate lenders lend against asset value, not cash flow. Although I am skeptical about the traditional explanation of the workings of interest rate policy, real estate is where interest rates probably matter the most. I do not think it would be too controversial to argue that "high" interest rates doomed a number of real estate markets, which had severe effects on growth. The question remains whether moderate interest rate changes have the effects that conventional economists assert they do. Although snugging interest rates should have an effect on fair values for real estate, prices are still a market phenomenon. For example, interest rate changes are also supposed to have an effect on equity fair values, but it is hard to see how observed prices are changed by policy rate moves. There are wide variations in the forms of housing finance. I am most familiar with the situation in the "Anglo" countries, where there are differences. The United States features 30 year conventional mortgages, whereas terms are (were?) quite short in the United Kingdom. This meant that policy rate changes -- which directly moves floating rates -- have a more direct link to the standard borrowing rates. The changes in housing finance is one reason I draw a line between the post-1990 era and the earlier post-war decades (which featured a much more conservative regulatory scheme). In particular, the problems faced by the regulated banking system when central banks hiked rates in the 1970s to fight inflation would not be an issue at present. Banks have offloaded duration risk to end investors in a variety of ways (swaps, securitisations), and those end investors are themselves generally short duration versus their liability benchmarks. The concept of mortgage equity withdrawal -- a household being able to refinance a mortgage at a lower rate, and pocketing the savings -- is mainly an American phenomenon. Mortgage equity withdrawal helped provided a tailwind to growth in the United States in the 1990s and 2000s (until the Financial Crisis cut of lending). However, since my focus on recessions, I may not need to delve into this, although it matters for discussing the effects of interest rates. Demographics is a lie. The rate of formation of households is pro-cyclical; looking at the number of people in age cohorts is not enough to tell us about the demand for housing. As many parents have discovered the hard way, mature children can come back to live in their parents' basement. People can get roommates rather than live alone. The wealthier cohorts can sell second houses. This means that the demand for housing is more cyclical than the demand for food. This is disruptive for the over-simplified models of the household sector that I often use, as they understate the cyclical nature of household demand. When looking at housing, we cannot just look at investment in new construction; there is also considerable amounts spent on renovations (as any homeowner can attest). Fixing up your home (or extending it) is an alternative to moving. Furthermore, the act of moving is very expensive (once again, as anyone who has moved houses can attest), and those household expenses are someone else's income. I doubt that I will delve too deeply into commercial real estate. Once again, commercial real estate is interest rate sensitive, and is tightly tied to the fortunes of institutional investors. For example, rising employment of white collar workers generally creates demand for new office space (unless they shrink cubicle sizes). This means that commercial real estate is part of the Minsky debt dynamics. If we look at Japan, real estate was the vehicle for borrowing for non-financial corporations. When we look at the analysis of recession forecasting, we face serious causality issues. Is a recession the cause of weakness in the real estate market (since unemployed people -- or people who fear being unemployed -- are unlikely to buy larger houses), or is real estate weakness the cause of a recession? Depending on the circumstances, it could go either way. Most of these observations are straightforward. The only real theoretical challenges by what I discuss above is the questions of interest rate sensitivity: do they only matter for real estate? Possibly the only thing that may surprise readers is the importance of real estate for the economy -- although that may no longer be true after the Financial Crisis. However, the key observation with respect to recession forecasting is the point that the housing market is a market. In order to forecast the economy, you need to get that market forecast correct. I will then appeal to a rudimentary version of the Efficient Markets Hypothesis: if it were that easy to forecast the housing market, why isn't everyone else doing it (correctly)? This difficulty explains my general skepticism with respect to using mathematical economic models to forecast the economy.